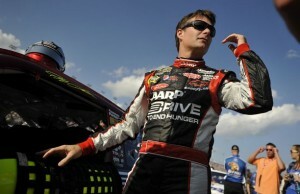 For those of you who follow NASCAR, you know that Jeff Gordon’s #24 Chevy has been called the Drive to End Hunger Chevrolet, sponsored by AARP. While organizations like Share Our Strength exist to bring awareness to childhood hunger, AARP and Jeff Gordon are bringing awareness to another critical segment of the population that needs our support: hunger among Americans over 50. Since the Drive to End Hunger was launched in 2011, they’ve donated 5.8 million meals and helped collect over $15 million in corporate and individual donations. But the need is still great. Today, far too many older and elderly Americans need help: over 9 million older Americans are threatened by hunger, or 1 in 11. Starting in today’s race in Bristol, Jeff Gordon had another sponsor on his #24 Chevy: The AARP Visa Card from Chase. They’ll be a sponsor for five NASCAR Sprint Cup Series races in total: today’s, Charlotte, Indianapolis, Richmond, and Dover. For everyone who signs up for the card, Chase will donate $1 to AARP Foundation for Drive to End Hunger. In addition, three cents from every purchase will be made, up to a total of $2 million. While Jeff unfortunately didn’t have the best of luck today (he was running in the top 5 but was clipped by teammate Dale Earnhardt Jr. and ended up crashing into the Turn 3 wall), you can bet that #24 will be back in racing form in Charlotte on May 27!